It’s amazing what you can learn in a year. When 2014 started out, our family played board games about once every couple of weeks. Fast-forward to today and you’ll find us hunched over a board arguing about the rules at least 3 times a week. Old-fashioned board gaming has truly become an integral part of our family. You’ve seen our great Thrift Treasures nearly every Sunday and have been introduced to a number of board game publishers that you’ve never seen on the shelves at your local big box stores. But exactly what have we learned from all of this game play? 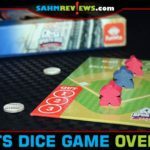 We discovered that there is a whole world of board games and toys that never sit under the fluorescent lights of a local retailer, but are a much better value for your hard-earned dollars. This year we’ve decided to salute those games that deserve a coveted spot under your tree. We could go on-and-on with fantastic offerings in any price range, but in the interest of keeping our recommendations appropriate for your immediate family or gift-buying for your extended family and friends, all of these games have a suggested retail price of under $29. Many (if not most) can be found discounted even further, especially during the holiday shopping season! We’ve provided handy links to each game’s manufacturer’s website as well as direct links so you can purchase it on Amazon. If you see a publisher that looks like they have other products that also would be enjoyed by your family, follow them on Facebook and Twitter to watch for promotions, appearances and new product announcements! So without further adieu and in no particular order (other than alphabetical), these are our suggestions for affordable games that should be under your tree this year! 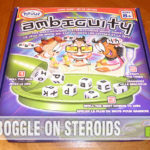 In this exciting and cutthroat word game, players race to score the most points by spelling words. But watch out for the ALPHA BANDITS! They let players grab, swap and banish letters to win the game! Features 144 letter, gemstone and bandit pieces! 4 Masks, loot bag, pencil & instruction booklet! Use strategy by using Bandit Tiles to swap and grab opponent’s letters! 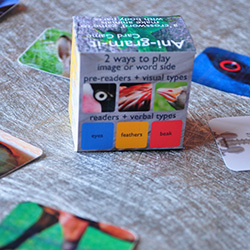 Perfect for travel and impromptu sessions of biology, Ani-Gram-It comes complete with 100 laminated, color-coded cards and can be played on a table, the floor, the grass, a picnic blanket, or any other number of spaces! It’s a great fit for the whole family, with little ones learning to name body parts and recognize different animals before they can even play. 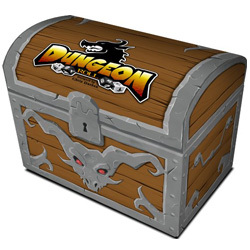 In Dungeon Roll, your goal is to collect the most experience points by defeating monsters, battling the dragon, and amassing treasure. You become a Mercenary, Half-Goblin, Enchantress or other type of Hero. Then you boldly enter the dungeon seeking glory. The Adventurer assembles their party by rolling seven party dice, while another player serves as the Dungeon Lord and rolls a number of dungeon dice based on how far the Adventurer has progressed through the dungeon. Defeating the dragon is a team effort, requiring three different companion types. Welcome to the city of Machi Koro, the Japanese card game that is sweeping the world. You’ve just been elected Mayor! Unfortunately the citizens have some pretty big demands: jobs, a theme park, a couple of cheese factories and maybe even a radio tower. A tough proposition since the city currently consists of a wheat field, a bakery and a single die. Armed only with only this, you must grow Machi Koro into the largest city in the region. You will need to collect income from developments, build public works and steal from your neighbor’s coffers. Just make sure they aren’t doing the same to you! Machi Koro is a fast-paced light-hearted game for you and up to 3 friends. 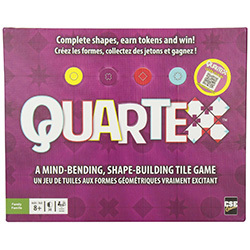 Quartex™ is an engaging, award-winning abstract strategy tile game for the whole family. A board game and puzzle in one. Match sides, complete shapes and earn tokens. Here’s the fun twist – as the number of tokens collected increases, their value decreases. Sometimes, less is more. 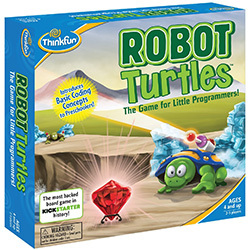 Robot Turtles is a board game for kids inspired by the Logo programming language. It provides crucial brain development and computer programming skills to children as young as 4 years old in the context of family fun. Players dictate the movements of their Robot Turtle tokens on a game board by playing Code Cards: Forward, Left and Right. When a player’s Robot Turtle reaches a jewel they win! If they make a mistake, they can use a Bug Card to undo a move. The game has many levels so, as the players advance, they will encounter obstacles like Ice Walls and use more complex Code Cards (like lasers to melt the walls). SEQUENCE has gone to the dogs! 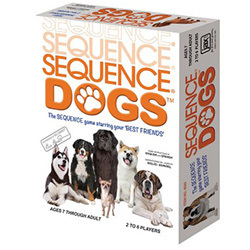 Enjoy the great game of SEQUENCE featuring a unique collection of cuddly canines. Be the first player to get 5 chips in a row by matching the pooch pictured on your cards to the same ones on the gameboard. Each card also has a brief description or fact about the breed of dog shown. So go ‘fetch’ your family and friends for a fun, strategic game of SEQUENCE DOGS! TENZI – The world’s fastest game! Everyone gets ten dice. Someone says, “Go!” Then everyone rolls and rolls as fast as they can until someone gets all their dice on the same number. Sure, there are a few more rules, but you get the idea. It’s a fun, fast frenzy! It’s TENZI. And there you have it! We’re sure you will find at least one game perfectly suited for your family, no matter the type of game they prefer. Whether they like rolling the dice, holding cards or moving around a board, they will be excited to see any of these under the tree this year! Be sure to pick them up online before they’re all sold out! Great list! You know I want games under my Christmas Tree! I have Tenzi, that’s the only one from that list. It’s a great game! Thanks for sharing this great list. We love playing games. I have not heard of an of these listed. You always have the most unique gift ideas that I wouldn’t have thought of but now I can’t live without. It’s nice to find a list that’s not the “same ol’ stuff” you see everywhere. My family LOVES board games and our 7 & 4 year old are finally staring to be fun to play with 🙂 Tenzi sounds like one we would have a blast with. Thanks for sharing. 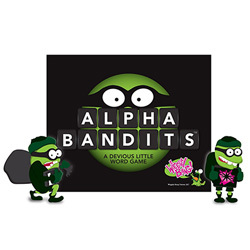 Alpha Bandits and Tenzi look like great picks, I am making my niece a game crate for Christmas, so these will be great ones to add. She love her games. What a great list of games! The price is certainly right. And although I live alone I agree–there is nothing quite like a family getting together and playing a board game! Now these are great suggestions! I love playing board games! Great list of games. They all sound fun. Board games are always great for game night with family and friends. I don’t think I have played any of those. I will have to be checking them out. I love board games. Now that my youngest is 2, she is starting to play more and more. These all sound great in different ways. I think Oddly Obvious would be fun to play with the family when everyone’s here for Christmas. Wow! There’s so many options. 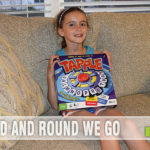 My kids and I love board games, thanks for sharing these! Awesome list! We love playing games in our family. I’ll be checking out Machi Koro for sure! Agree with everyone else. This is a great list and I plan on putting quite a few of these under my tree for my kids. We are a big board gaming family! I have not heard of these games, but I love playing games and the one that I want to get is the Sequence Dogs game.These games do not cost a lot and make great Christmas Gifts! What a great list! I think I know a few people who would like to see this list! I will share your blog link. 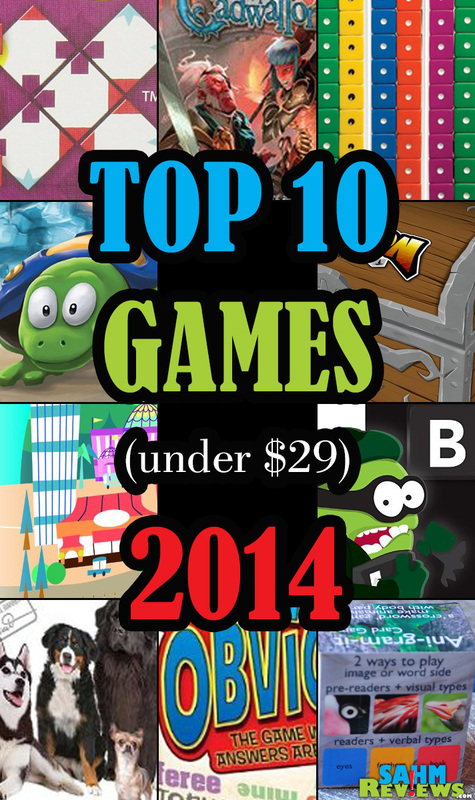 This is a great list of games to buy as gifts this holiday season. My boys would really enjoy playing all of these. These are some good choices. I am going to buy my son some educational games. He loves math. I am so out of the loop! I haven’t heard of any of these games, but they all do sound like so much fun! I think Alpha Bandits would be one of my favorites! 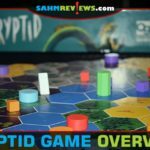 Great list of games, we love board games. Shared on Linkedin. That is an excellent and thorough gift! I am bookmarking it in case anyone asks me for recommendations, I will tell them to take yours! Thanks for the ideas. I always struggle with the nieces and nephews. And I really want to play Robot Turtle myself. Great list of games and I love the price point! That will make shopping a breeze! my son would love sequence dogs. he is obsessed with dogs! Guilds of Cadwallon and Dungeon roll sound SUPER cool. I’ll have to check them out. We love having family game night. I can’t believe how many of these I haven’t heard of before. You’ve given me some really great ideas here. Thanks! That is an awesome list of ideas! I might get my boys a few for Christmas! I am such a big board game fan, so I love this list. I need to add a few new to my collection! I had not heard of Tenzi, but it sounds pretty interesting. I’ve always liked games that involved dice. These all sound like great games. My family enjoys sitting down and playing games, the Turtle Robots sounds right up my boys alley! What a very interesting list of games and at such an affordable cost! I am always looking for new games for my older children! Thank you for sharing this list! Ahhh these look like some fun games!!! We have game night all the time so I will have to check some of these out! 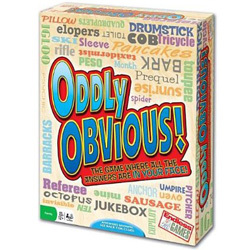 I am going to have to look for Oddly Obvious. We have a game night with another couple (plus our kids). We like to play trivia-style and fun games (like Apples To Apples, and Smart @$$). I feel like we are about to run out of games to play and that Oddly Obvious would be a lot of fun for us. Thanks for including it in your list – I had not heard of it before. I am always on the hunt for new games! Great list! Dov – Ask and you shall receive! We did a writeup about it this past summer! Those are truly worth it! <3 I can't believe they are under 30! 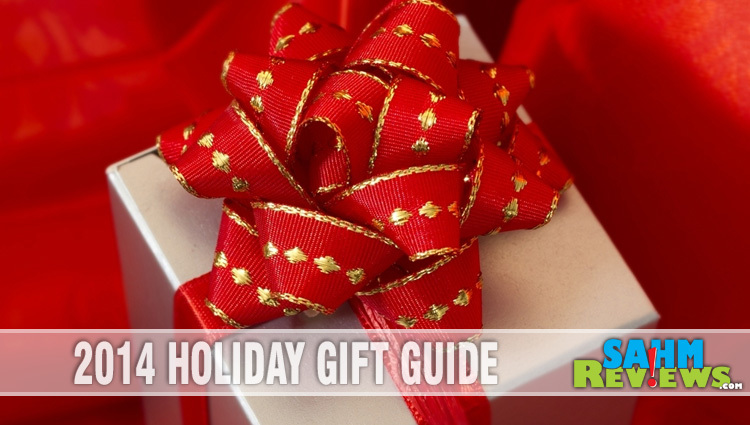 Love your gift guide. We love to play board games. It’s a great way to spend time with the family…and beat them at everything. What a great list of games! It’s been a long time since I’ve played any, but now I’m kinda in the mood for it after reading your post! These all look like fun games and very reasonably priced too! We love games, especially hobby games. 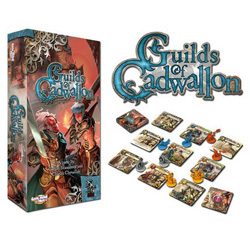 Guilds Of Cadwallen looks really interesting! Thanks for the great roundup. What a great list of games! 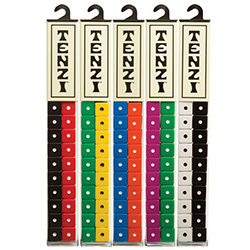 The Tenzi dice games looks like a game my family would enjoy. What a great list of suggestions! Oddly Obvious seems like it would be fun! Wow definitely sounds like some fun choices. 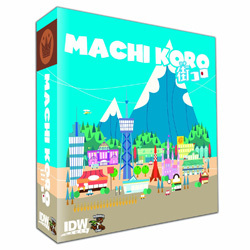 I would really like to play Machi Koro. Sounds like fun. We love games and you always share the best ones. I have to check out the Oddly Obvious one.